Over the past few months, the world watched in horror as a brutal family separation policy adopted by the U.S government tore children away from the arms of their desperate parents. Recently, the Chinese government began to implement a similar strategy. In early August this year, news spread about China’s “re-education” camps for Uighurs, a predominantly Muslim, ethnic minority concentrated in China’s Northwestern Xinjiang region. The Chinese government detained Muslims in what they referred to as “re-education” facilities. Once arrested and held without trial, detainees would undergo what can only be described as psychological torture. Through the detention program, the camps aim to eradicate the prisoners’ Islamic beliefs, and reshape their identities, causing long-term psychological trauma. The mass internment system doesn’t just affect those incarcerated. When a family member is detained in the “re-education” camps, their children are taken away to state-run orphanages. Isolated from loved ones, children trapped in these orphanages are subjected to a total undoing of their culture, beliefs, and language. 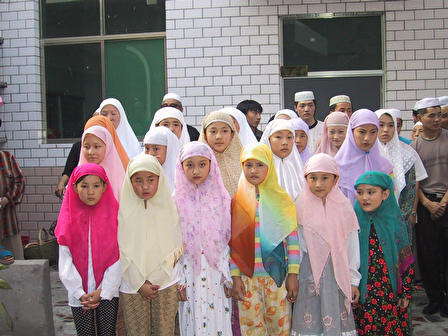 Children trapped in these orphanages are forced to renounce Islam and accept the values of the Chinese Communist Party. Such efforts purposefully enable the government of China to reshape the identities of an entire generation. Aside from the devastating psychological harm that comes with being in an orphanage, the facilities cause physical harm to the children. Due to over-crowded conditions, children anywhere from age 6 to 12 years old are shoved into congested cells like animals. Forced to survive in such horrendous conditions, these children undergo a devastating loss of their sense of self. Parents trapped in the re-education camps suffer as they have no knowledge about the specific whereabouts of their young children. Some family members who were lucky enough to locate their offspring, witnessed their children transformed into hate-filled versions of the loving, Muslim children they were raised to be. This forceful separation of Muslim families depicts the most inhumane threat to the very fabric of human rights. The moment that we allow the total destruction of a person’s inner faith and identity, is the very instant we lose our humanity. The government behind these vicious family separations must be reminded of what it means to hold true to human rights policies and values. They must be held accountable for this heinous violation of the rights of their citizens. #MuslimGirlCampfire: Read All About My Pet From Beyond!